Pete and I were in Melbourne last weekend for Sarah’s memorial service. 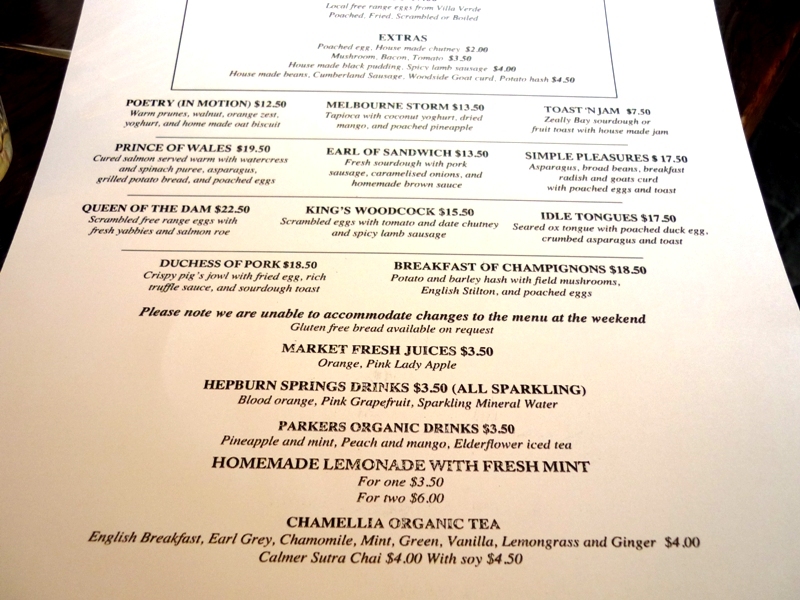 On Sunday morning, our friends David and Maree took us to a cafe in Spotswood, which boasted a most unusual breakfast menu (click on the photo above, plus this link, for a better look). Situated in a former industrial area, this little venue was hidden in a quiet line of mostly closed shops. The place was packed. I had an inkling of what was to come when the waitress informed us that the specials of the day were crumbed lambs’ brains with gentlemen’s relish (not made from naughty body parts, although I did ask), and home-smoked trumpeter. The breakfast menu offered black pudding, Cumberland sausage, yabbies, ox tongue, field mushrooms, pig’s jowls and more. Melbourne is a long way from Sydney, but we might need to fly down again just to try out a few more dishes from this wonderful menu! Absolutely my kind of food. Rather a long way from Dubai. I am so hungry right now…. Wow, I need to get out and travel more… I have never tasted any of these dishes! They sound so… scary… but delicious! C, I was sorely tempted, especially with all the sides on offer! What a fun place, and what an awesome menu. I love places that are a little out of the ordinary. This is indeed a dangerous post to read before breakfast! Fantastic breakfast menu. I love going out for breakfast but am usually so disappointed with the boring, predictable menus. This place has been creative with the descriptions as well as the food itself. Double tick. Must try next time I am in Melbourne. Where’s the fun in that?! :) You know me too well…. My idea of restaurant heaven is a delicious breakfast menu and that one looks beautiful. Have you ever been to the original Bill’s in Surry HIlls Celia? I thoroughly recommend it if you haven’t. Rose, thank you for the tip, I haven’t tried Bill’s for breakfast (although I have been there for dinner). Will have to give it a go! What a great menu, the best breakfast menu I think I have seen. It would be difficult to decide on which dish to try first. You would need to visit more than once. Great prices for such thought and care, and humour! I think that menu might be a little too adventurous for me but it sounds like a great concept. What a brilliant find, Celia! I’ll have to pay a visit on our next Melbourne trip to indulge in the Duchess of Pork dish – it looks splendid. A, it was beautiful, but make sure you get a side order of black pudding. It was to die for! Hey Celia, it was great to see you and Pete again. Pity we can’t do it more often. As your pedantic friend, I think I should make a couple of clarifications. Firstly, you ordered the Duchess of Pork sans black pudding. It was only after eating half of mine, that you placed a supplementary side order which you subsequently made pretty short work of. Am I correct in understanding that you were able to survive on lettuce and water for the rest of the day?? Thankyou for a wonderful description. Melbourne does cafes very very well. Nice memories…. Craig, we were astounded by how good all the food in Melbourne was – we didn’t have a bad dish the whole time we were there! Celia, black pudding is amazing. As a child, we often ate it at weddings (would you believe!). That’s Hungarians for you. Melbourne is a mecca for good food! But then, many other places in Australia have fantastic food too. What a fantastic and imaginative breakfast menu! And the black pudding looks amazing, I adore it, but find it hard to get REALLY good ones around here. poetry (in motion), yes please. Now that is just the kind of way I like to start my day! I love an inventive breakfast menu. Waw, All of the food looks so tasty & well flavoured, I think! Well there’s somewhere to remember next time I’m in Melbourne. Last time I stuffed myself with gelato and Italian treats at a small cafe in Reservoir. It is almost worth moving there to have that in your neighbourhood! As a person horribly allergic to pork (except well-cured) I recently found out an interesting thing. I had tapas at Verandah in Pokolbin (Hunter Valley) and there was a house-made spanish blood sausage which my dear husband ordered. Very tasty, but scary and even more scary when I found out it was pig’s blood. However, it had no effect whatsoever! Perhaps it was countered by the accompanying wine. Nic, Tania, thank you, it was a fantastic meal! Sophie, the eggs here were just beautiful, all free range and perfectly cooked! Vix, being allergic to pork would put a serious crimp on our diet! Glad the blood pudding didn’t do you any harm though!